Loving the cooler weather and it’s great to be able to run or ride again and not end up a sweaty mess. Darwin’s dry season is definitely in full swing again and everyone is in busy mode. We do hope you will be able to take some time out and kick back and relax with us at our annual Presentation Dinner. This year we have gone for a casual, outdoor, family friendly sunset function. You will be happy to know we haven’t skimped on the menu! Belinda Townend has arranged all the catering details and we are sure you will enjoy the options. Member tickets are discounted and kids under 10 are free. We do need to know numbers for catering so jump in now and get your tickets here. 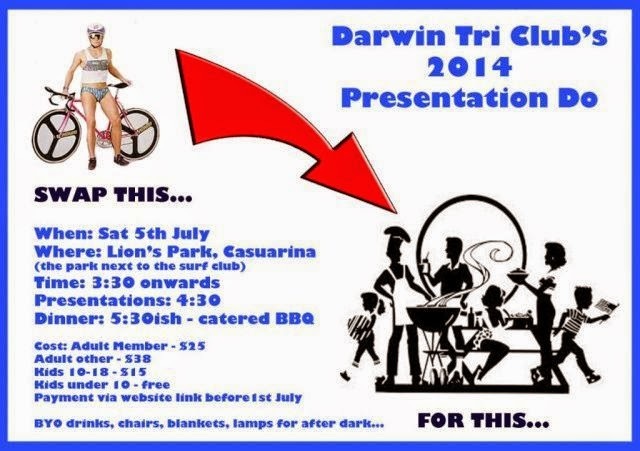 Come join us on Saturday 5 July 2014 as we celebrate the end of our season and present our annual awards. Also a great opportunity to get to know fellow members better and to see what they look like out of lycra! 1. Want to check if you have already entered – use the search link at the bottom of the online entry landing page. 1. Good luck to our members taking part in the Katherine to Darwin Challenge Ride this weekend. 2. Triathlon NT’s junior development camp is underway. You may want to brush up on your riding skills once you check this. 3. Tony Cox and Hollie Goodall were among those doing the CEO Sleepout to raise awareness of homelessness (and fundraise) in our community. 4. All members are invited to attend the upcoming Level 1 Technical Officials Course. It’s a great way to learn the rules of our sport and perhaps help out at an event in the future. If you know someone who doesn’t compete but would like to get involved, encourage them to attend as well. 5. Our online entry for each event will now include a search function so if you are unsure, you can check if you have already entered or not. 6. Club gear order – you will have seen members racing and training in our awesome club colours. If you would you be interested in ordering a club cap, trisuit, tri shorts or tri top or want to suggest a new club themed item, please respond to this email. Expressions of interest will depend on whether an order proceeds or not (due to minimum number requirements).